I stumbled across this today on Youtube and it’s relentless energy is a perfect reflection of both my week and feelings today as London was bathed in sunshine. Look out for a guest post from resident dancehead Dom tomorrow. I’ll check back in on Monday, also look out for my best of 2012 so far list. I am just applying the finishing touches. This classic 70’s funky disco tune seemed apt to post today, which featured both bright sunshine and heavy rain in North London. I first heard it when it was sampled in several of my favourite hip hop tunes like Can I kick it? by A tribe called Quest and this Ghostface tune. Montreal artist Grimes is another whom I have heard much about so far in 2012, and she has featured prominently in the “Best of so far…” lists I have been reading recently as the half-year approaches. She kind of reminds me of other one-woman troubadours tUnE-yArDs and Grouper who were favourites from last year. I really like this track too, there is something in the synth that is delightfully 80’s. You may be more familiar with the Massive Attack cover of this song, from their Blue Lines album. However, this is the original and, in my opinion, superior version. It is so mellow and smooth, just a perfect example of 70’s soul. 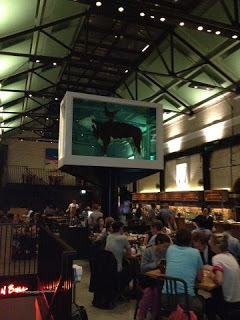 Tramshed was excellent last night. The food was simple but full of flavour. Very hip decor and a great space (see below). As the half-year approaches I have been reading a few “Best of 2012 so far” lists (as well as trying to compile my own). These guys showed up on a couple of lists and I quite enjoyed this track. They are a Swedish band, and not in fact a singer that was born Michael Snow. Those crazy Swedes! The track has a classic Euro-electro sound that has been quite prominent of late (see M83, Air France, Delorean etc..). I’m out for dinner for a friend’s birthday this evening. We are going to a restaurant that only serves Chicken and Steak. Think I might give the meat cocktail a miss though. I will report back tomorrow. As I’ve mentioned before, one of the bigger surprises for me in the 18 months I have spent blogging is how the affection I have for world music has risen. This track, along with Paul Simon’s Graceland, are the earliest memories I have of world music. It features three languages; Wolof (a Senegalese language), French and English and whilst it perhaps seems a little lightweight now it certainly had a lasting impact on me. I have a little soft spot for singers that have a very obvious accent, given my own adventures in this field London. I spent about the first 18 months of living here being met by almost uniform blank looks (it still happens frequently). Sunderland band The Futureheads are one such band. I suspected that they had been consigned to the annuls of one hit wonders after releasing a spectacular Kate Bush cover which I posted last year. However, I was surprised to hear them play this track live on TV last night and was very taken by it. It’s another cover, this time of British singer Richard Thompson and is taken from their recently released album Rant. This is perfectly melancholy. It is pure, blue-eyed soul. I was reminded of it this week while listening to a new compilation album by Groove Armada called Late Night Tales – Music for pleasure, a compilation of awesomely terrible 70’s and 80’s pop. Have a great weekend. I hope it’s more uplifting than this song! Hackney band Rudimental were new to me this week, but it seems that I was rather late on them as they are currently number one in the UK pop charts. I guess that is a testament to how irrelevant charts have become to me. Perhaps they should change it to reflect the most watched videos on Youtube. I was out for dinner tonight in one of my favourite curry houses in London, Tayybs in Whitechapel. Check it out if you are ever in that neck of the woods, it is worth the queue.